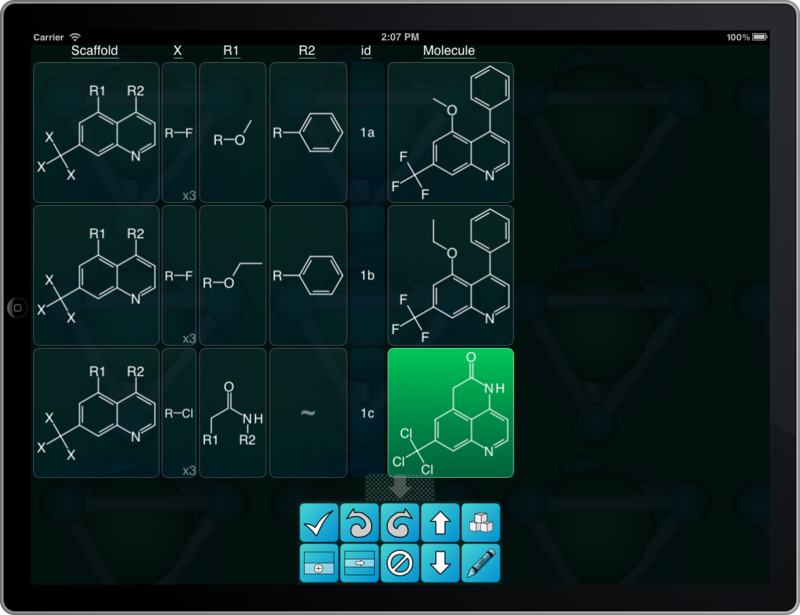 Like all the rest of the apps from Molecular Materials Informatics, it draws heavily on core functionality for viewing, editing and drawing molecules and collections of molecules, which originates from the Mobile Molecular DataSheet (MMDS) project. This app, though, zooms in on a narrower focus than its predecessors, and endeavours to solve a single problem (or rather, two problems that are actually the same). As any chemist knows, there are numerous journals that are packed full of articles which contain tables that list a bunch of compounds, most/all of them in a series, each of them with an identification number and some numerical or descriptive properties, and all of the structures abbreviated in various ways. The scaffold/substituent/data table is an effective way to condense a lot of data into a small space, which is a significant benefit for printed literature. Chemical structures take up a lot of space, and when most of the structural features are the same, it is often both more economical and more informative to abstract out and abbreviate the common fragments. From the author’s point of view, this is all very well, but these tables can be quite tiresome to create. The definition schemes can start to get quite convoluted. The list of chemical structures needing to be described does not always make itself the most convenient to represent, and it is critically important that the authors make no mistakes. As the abbreviation scheme gets more complicated, mistakes get easier to make, and so the tables must be checked, re-checked, and checked a few more times, just to make sure that the correct actual structure is implied. 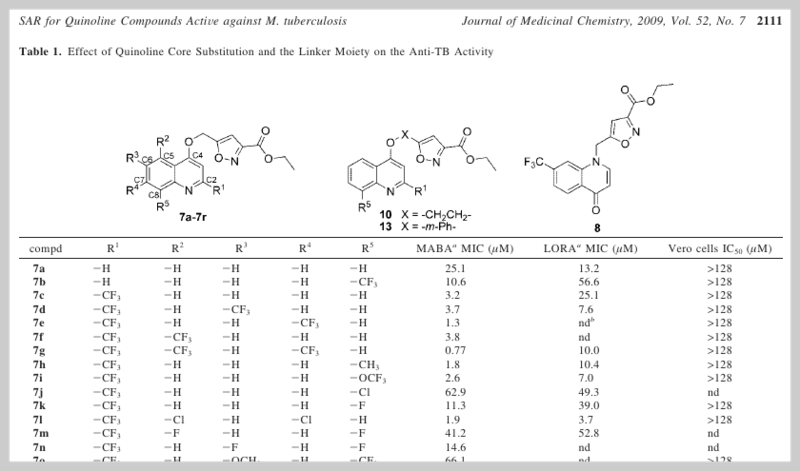 From the reader’s point of view, the comprehension of these structure-activity relationship tables is generally quite clear, but there are a number of reasons why it would be useful to also have a list of the structures, fully expanded out by linking up the scaffolds with all their substituents, and expanding out the abbreviations. Sometimes it’s easier to understand the chemistry that way, and sometimes it is necessary to have a list of the actual structures. One such case that springs to mind is when the compounds are going to be added into a larger list (e.g. a general purpose collection of structure-activity data from multiple sources), or when the data needs to be submitted to some cheminformatics procedure (QSAR immediately springs to mind). The purpose of the SAR Table app is to define a datastructure which keeps this data together in one place, then builds on top of it a user interface that minimises the amount of data entry (since there are so many recurring fragments), and makes it possible to produce a presentable document that can be inserted into a publication manuscript. SAR Table v1.0, which is now available on the AppStore, takes a shot at improving the process of generating structure-activity tables, whether it is for creating the table for the first time in order to publish/communicate it, or for reentering data from an external source. This first version is a minimum-viable-product release, which means that in spite of being already very powerful, there is an aggressive roadmap of new features on the way. Check out the introductory article for a walkthrough tutorial that describes key aspects of the current functionality.